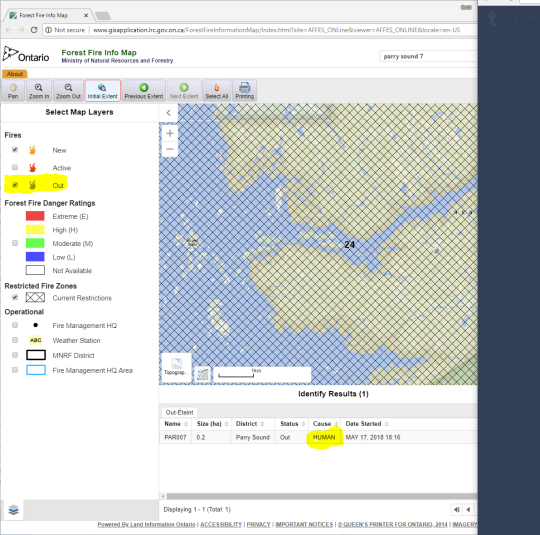 8 days ago I posted on the Henvey Inlet fire that continues to burn with an unchanged status of “Not Under Control”, as indicated on the Ministry of Natural Resources and Forestry’s GIS application (shown below)- but following my post the “Cause” status was changed, from “HUMAN” to nothing at all. 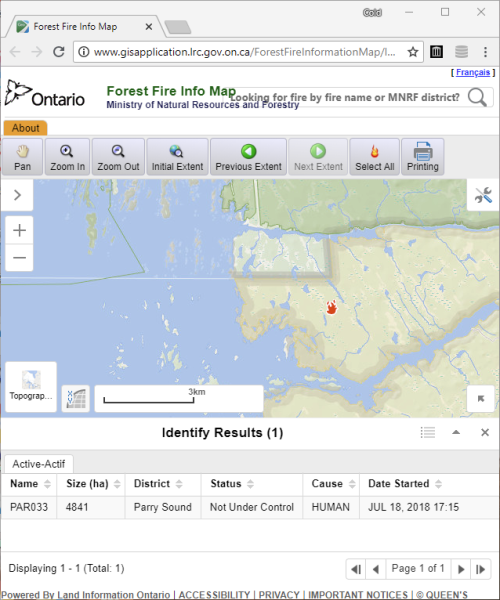 I was alerted that the MNR’s GIS tool also has an “Out” option, and that reveals a fire identified as Parry Sound 7, started May 17, 2018. As I post this, that fire remains identified as having a “HUMAN” cause. Parry Sound 7 is listed as only 0.2 hectares in size (Parry Sound 33 is nearing 9000 ha), but it was reported and that begs the questions about the Ministry’s, and the wind farm developer’s, investigation and response. This is particularly true as fire intensity codes for industrial operations exist. Were fire intensity codes applicable to Pattern’s wind project, and were the “several small fires” the CBC was told, by “a number of workers”, preceded Parry Sound 33 reported to the appropriate authority – presumably the MNR? I thought a short post is in order as the incoming mainstream media reports are not informative or in any way helpful.